To arrive at consistent colour we adopt standard colour spaces, which are agreed as international standards. A colour space contains a selection of all the visible colours. The colour space sRGB was intended to represent and contain all the colours that could be generated and shown on typical consumer grade displays and devices. The straight-line bottom boundary represents all the purple shades that can be formed by mixing the extreme blue-violet and the red. 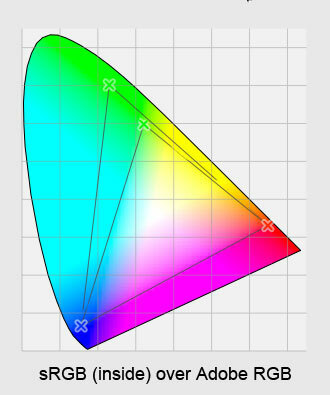 The corners of the superimposed triangle indicate the values of saturated red, green and blue for the sRGB colour space. These are sRGB’s three primary colours. All the colours that can be displayed in sRGB are mixtures of various proportions of these three primary colours shown at the corners of the triangle. In sRGB we can generate and display the visible colours that lie within this triangle. Those colours that lie outside the triangle cannot be shown, because they cannot be obtained by mixing these three primary colours. They are said to be out of gamut in sRGB. Notice how much of the horseshoe area, representing visible light, lies outside the sRGB triangle. sRGB is quite a small colour space, and many colours simply cannot be represented. Adobe devised a larger colour space which is called Adobe RGB (1998), shown in the left-hand figure above. Notice that in Adobe RGB (1998) the green point at the top of the triangle lies much further up the visible space than in sRGB, In the right-hand figure above, the sRGB triangle has been superimposed on the Adobe RGB picture, so that the difference can be seen clearly. Adobe RGB (1998) is a rather bigger colour space than sRGB, and the whole Adobe triangle covers a good deal more of the visible spectrum than does sRGB. It follows that Adobe RGB (1998) can display many colours that are out of gamut in sRGB. The converse is also significant: sRGB cannot show many of the colours that are included the Adobe RGB (1998). Experienced photographers will recall that some colour transparency emulsions have a much larger gamut than other emulsions. Incidentally there are many other colour spaces apart from sRGB and Adobe RGB (1998). Some are colour spaces of real devices, and some camera manufacturers define their own colour spaces. sRGB and Adobe RGB are theoretical, or artificial colour spaces, not those of any real systems. They are mathematical models of colour spaces. These spaces are termed well-behaved colour spaces because any RGB triplet in which the three colour values are identical produces a pure shade of grey. Real devices like monitors and printers sometimes have a slight colour cast when presented with a similar pure grey. Sometimes indeed the colour cast from pure grey may vary with the brightness. We normally set our Canon XEED SX60 projector to sRGB. Many cameras let you choose to record your shots in sRGB or in Adobe RBG, or the camera might have its own colour space, which may be a variant of sRGB. The specification or user manual should give you these details. Normally an image file contains both the actual image, and information about that image, which is called metadata. The metadata usually contains shooting and camera details. The metadata can include details of which colour space is used for the image, and even details about that colour space. This is often called a colour tag. In Photoshop, the Save/Save As dialogue allows you to embed details of the colour profile in the metadata in the saved image file. You simply check the appropriate box in the dialogue: Color: Embed Color Profile … or similar. The DiCentra software that we use to prepare and run competitions is able to read the embedded colour tag in each individual image to determine which colour space that image uses. Normally we tell DiCentra to create the competition in sRGB, because that is the normal setting for the projector. • If the submitted image is tagged as sRGB it will be displayed ‘as is’ with no change. • If it is tagged as being in colour space other than sRGB, then DiCentra will try to convert the image colours to sRGB. To do this the computer that is being used to create the competition needs to have details of the original colour space, if it is a well-known one, or the metadata in the image file might contain not just the colour tag, but also detailed profile information about that particular colour space. • The image may have no embedded colour tag, or the colour space that is used might be not be a known one. In this case we usually tell DiCentra to assume that the image is sRGB. The moral here is to ensure that your image is in sRGB, converted beforehand if necessary, and that the saved image file has the correct colour tag embedded. The colours of a projected view of your image may differ from those that you remember seeing on your monitor. Check first that your image was correctly colour tagged. The “sRGB colour” produced by the Canon XEED SX60 projector is not perfect, but it is pretty close. It is possible that your monitor is not set to display the standard colours of sRGB. Many ordinary monitors cannot show all the colours that exist in an image, particularly if the image is Adobe RGB (1998). The real colours may actually be out of gamut on the monitor. Not all monitors can show all the colours within the sRGB space, and few ordinary monitors can encompass the entire gamut of Adobe RGB (1998). Finally, if you study camera reviews - particularly head-to-head reviews of two competing cameras - you’ll have noticed how frequently images of the same scene shot on two cameras differ so markedly. Consumer grade colour is still far from consistent. Colour fidelity is improving slowly, but unfortunately it is not (yet) a major selling point. © Michael Wood, 27 October 2008.